Site Search Searching for something else? Louisville, Ky. – Ford Motor Company will create 2,000 new jobs and invest $1.3 billion in its Kentucky Truck Plant in Louisville to support the launch of the all-new 2017 Ford F-Series Super Duty truck. Ford is investing $1.3 billion for an all-new body shop, facility upgrades and retooling to build the new aluminum-bodied Super Duty truck at Kentucky Truck Plant. 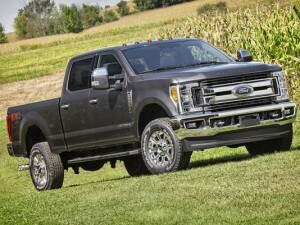 Add to that the $80 million invested in 2014 to meet growing customer demand for Super Duty trucks and $129 million to support Lincoln MKC production at Louisville Assembly Plant, and Ford has invested more than $1.5 billion in the commonwealth of Kentucky and the city of Louisville in the past two years. Kentucky Truck Plant produces F-250, F-350, F-450 and F-550 Super Duty pickups and chassis cabs, as well as Ford Expedition and Lincoln Navigator. The plant has produced more than 5 million Ford F-Series Super Duty trucks since it was introduced in 1999. Ford began manufacturing vehicles in Kentucky in 1913 with 11 employees. Kentucky Truck Plant, which opened in 1969, covers 6 million s.f. and employs close to 4,400 people. The all-new 2017 F-Series Super Duty pickup and chassis cab lineup is the toughest, smartest and most capable ever. This entry was posted in Mayor's Community Conversations. Call us at (502) 574-6380 or email pva@jeffersonpva.ky.gov. Call (502) 498-8477 or email jeffersonpva@viastudio.com.